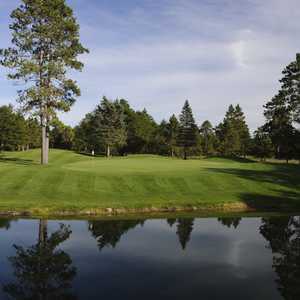 LEWISTON, Mich. -- With four first tees within steps of each other and long northern Michigan summer days, Garland Lodge and Resort is about as ripe for a summer golf binge as the Midwest offers. Garland Lodge and Resort has four golf courses within footsteps of each other. Only twice as an adult have I managed to play 54 holes of full-length golf in a single summer day -- both times at Garland -- in 2006 and this summer. The golf at Garland Lodge and Resort has been largely the same during that span, but the property has seen quite a transformation. Located in Lewiston, a small village in Michigan's north-central region a few miles east of I-75, Garland has been a top golf retreat for many years. The Otto family, the original owners of the resort, sold Garland to New Frontier Capital in August 2009. This year, new management has brought in a new attitude. While there were plans for a fifth golf course during the real estate boom, those plans have been scrapped for now in favor of increasing the resort's existing facilities and diversifying resort activities. Since its purchase, ownership has invested in the resort's grounds, including a new putting course ideal for a little happy-hour activity, and plans for a new spa are in the near future. Garland is also beefing up excursions (like to the nearby Au Sable River for fly-fishing). A new chef, Eddie Walker, was brought in to deliver food and beverage as noticeable as the mighty lodge structure he serves in. As for golf, Garland's 72 holes haven't changed all that much. Glen Brancheau, superintendent for 20-plus years, still oversees the grounds daily with his Labrador. 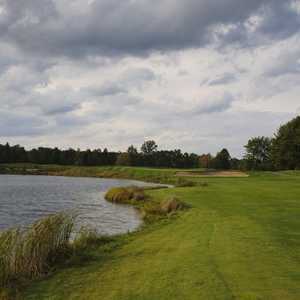 While northern Michigan has hilly courses built around ski resorts like in Gaylord and Bellaire, Garland's golf courses are a mix of forest and meadows more akin to Tullymore. In fact, gently rolling and heavily pined and splattered with ponds and lakes makes for an atmosphere more similar to what you might find down in the Carolina Sandhills or some of Hilton Head Island's more secluded plays. A handful of resorts in northern Michigan have four golf courses: Boyne Highlands, Treetops Resort and Shanty Creek Resorts. But none can boast four courses all played out of one clubhouse. That's Garland's appeal to the golf addict. Once you finish your morning round, simply walk into the pro shop and ask which course is open, and you don't even have to change golf carts. My thought during my first visit in 2006, and what was reaffirmed by my second visit to the resort, is that I'm surprised that the golf courses at Garland Lodge and Resort aren't higher ranked. It's likely a result of a few factors. First, the Otto family -- and not nationally known architects like Jack Nicklaus, Arnold Palmer and Tom Fazio -- built all four courses. Second, it's tough to nail down a standout course at Garland: Swampfire is a shot-maker's course with some narrow doglegs and water on 16 holes to navigate. The Fountains Course, with six par 3s, six par 4s, six par 5s and plenty of water, is the most exciting play. Reflections, at just 6,400 yards, is a shorter, narrow test. And the Monarch Course, at more than 7,100 yards, is a more traditional layout with four par 5s and four par 3s. It's the resort's best test for low-handicappers. There also aren't signature holes among Garland's 72 as much as a consistent, secluded and scenic setting on every hole. Maybe it's not the best formula for golf course panelists, but for weekend golf trips, it's ideal. Garland offers unlimited golf packages to its four courses that start at just $139, which is all the more reason to see how many holes you can squeeze in on one day. It's fully possible on the right day, with an early enough wake-up call and a little space on the tee sheet, to get in all 72 holes. been there about six times and i never get tired of the place. i've shot all four courses and love them all. swampfire is my favorite. quiet and pieceful setting. just you and nature. it's a class place with affordable fun!